Comedian James Corden might be the king of Carpool Karaoke, drawing out the biggest stars in Hollywood, but this week Corden has passed the crown along to a bunch of mums and their adorable kids after a video of them singing in the car went viral. With over 1 million views on YouTube (and even more on Facebook), the inspiring video titled ‘50 Mums | 50 Kids | 1 Extra Chromosome’ features 50 mums and their children singing and signing along to Christina Perri's, "A Thousand Years" in support of World Down Syndrome Day on March 21. The video caught the attention of Corden who called it “the most beautiful Carpool Karaoke” and even admitted it made him cry. And he’s not the only one - do not watch this without the Kleenex handy! 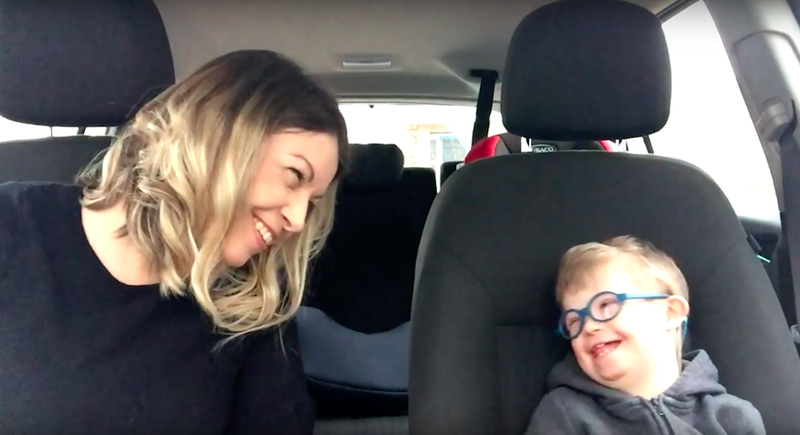 Mum Becky Carless, whose four-year-old son Archie has Down syndrome, came up with the idea for the video to help raise awareness for the condition and to show just how "ordinary and fun life is" and why they #wouldntchangeathing. "We thought what a nice opportunity to do something special this year,” she told ITV in the UK and described the response to the video as “overwhelming”. “There have been so many positive reactions and that’s just what we wanted to achieve. People with Down syndrome are born with 47 chromosomes in their cells instead of 46. There are currently over 13,000 people living with the condition in Australia, with an estimated 270 babies born every year. For more information on Down Syndrome and how you can take part in World Down Syndrome Day 2018, click here.